Whenever you draw or paint, establish the biggest parts first and work on the tiniest details last. When you are more comfortable with drafting the framework, you can make the head any shape that you want! You can also distort the proportions of the features and make them any shape you want. 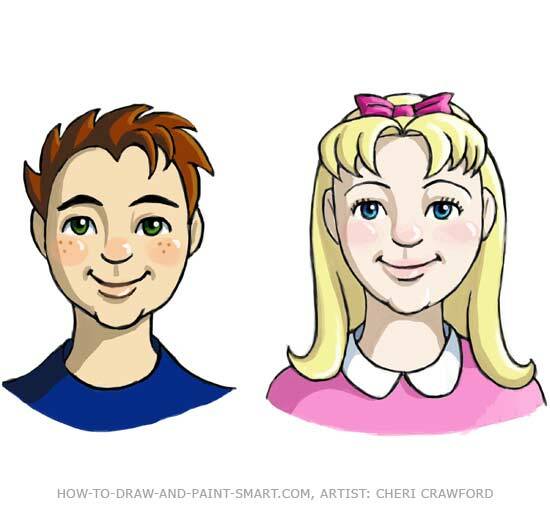 Children have round faces, so if you want to draw more life-like adults you will need to use alternate head shapes and exaggerate certain features. This will depend upon gender and age of your character. 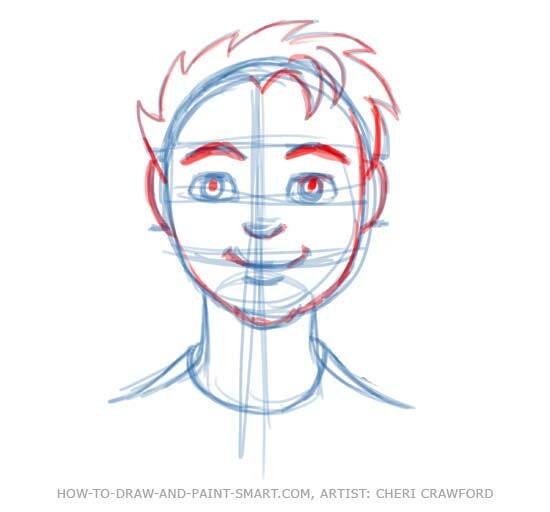 You can use most of these underlying drawing structures for any head shape, even when the head is drawn at a profile or ¾ view. 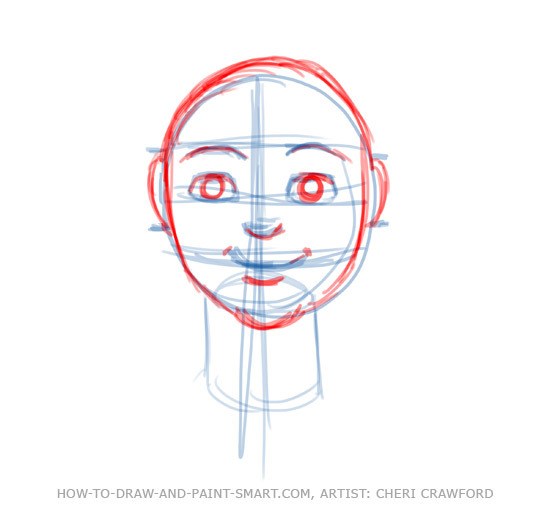 Because this is a basic tutorial, it is best used for drawing cartoon heads and for learning how to draw cartoon faces. What's not to love about the face? We see a heroic character, a glowing beauty, gruesome evildoers, and adorable little children. We are psychologically engrained to read human facial expressions for communication. You can take these simple steps to communicate your own expressions via a cartoon face. The Human Head and Face has always been my favorite thing to draw. It can come in a variety of shapes and sizes, the features can be made large or small, and adding skin tones and eye colors are like having dessert after a substantial meal of meat and potatoes. You will need a pencil, preferably one with a soft lead like an HB, a B, or a 2B. A regular #2 pencil will do just as well. Whichever you use, be sure to make loose, light strokes on your paper so you can erase the lines after inking the final rendition. Any ballpoint pen will suffice; for a smoother look I use special art pens that can be found at art supply shops and hobby/craft stores. 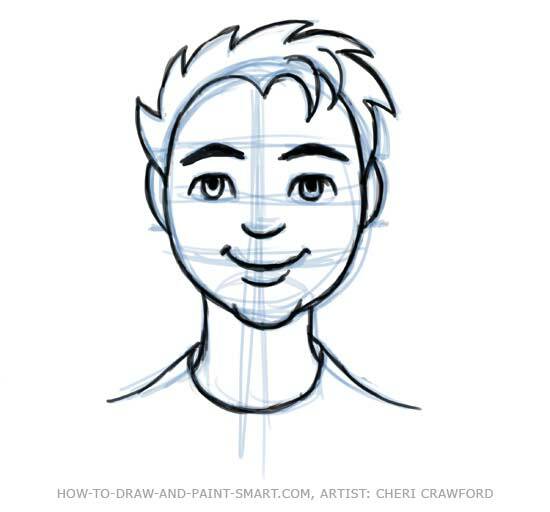 If using digital media such as Photoshop, be sure to create multiple layers to draw on and draw with thinner opacity settings until it is time to ink. After inking, just hide the layers you worked on instead of erasing. 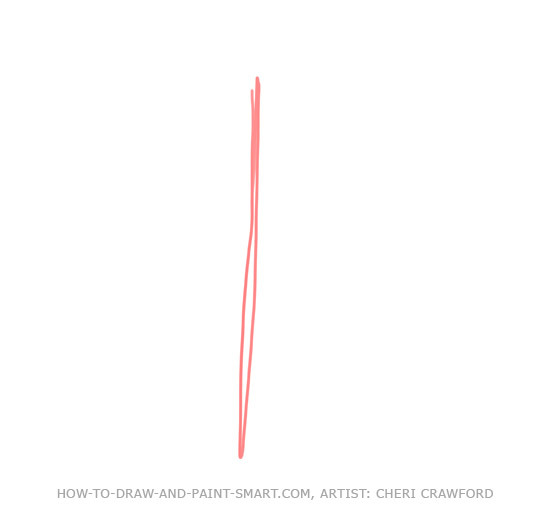 Now let's get started with the "Draw a Human Face"
Draw a vertical Gesture Line. This is going to mark the vertical center of the face. 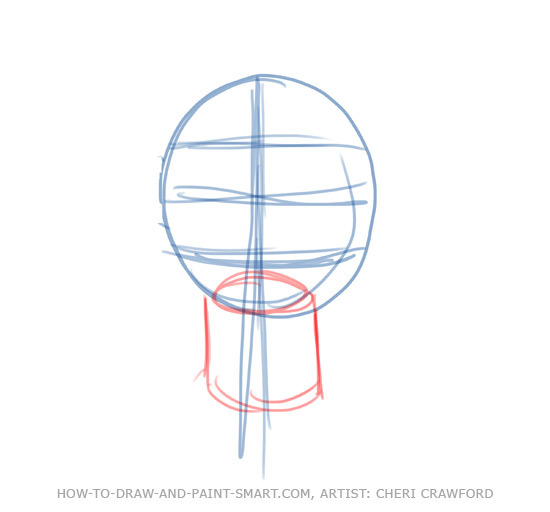 Draw a slightly elongated circle for the head shape over the top half of the gesture line. Divide the shape into three horizontal lines, equally spaced apart to create four spaces across the head. Next draw a cylinder shape underneath the head shape. This is going to be the foundation for the neck. Take a look in the mirror at your own neck-it is a cylinder in its simplest form. 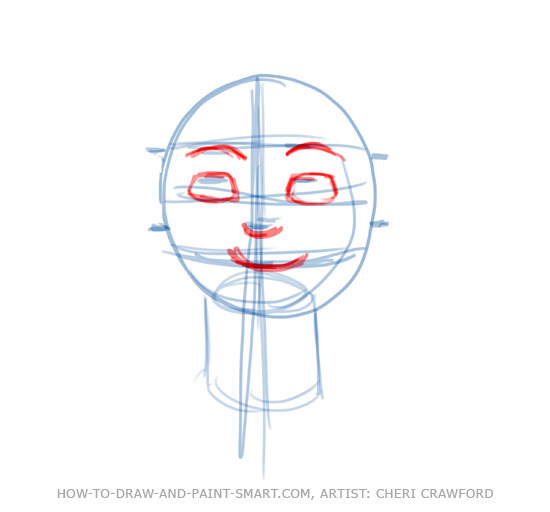 This part is very important: you are going to mark where the facial features go. Use the horizontal lines to guide you. The mouth is on the bottom line, the nose is between the bottom line and the middle line, the eyes are between the middle line and the top line (the bottom of the eyes will sit on the middle line), and the eyebrows are on the top line. The top of the ears always align with the eyebrows and the bottom of the ears are always aligned with the bottom of the nose. Now it is time to sketch in your features! 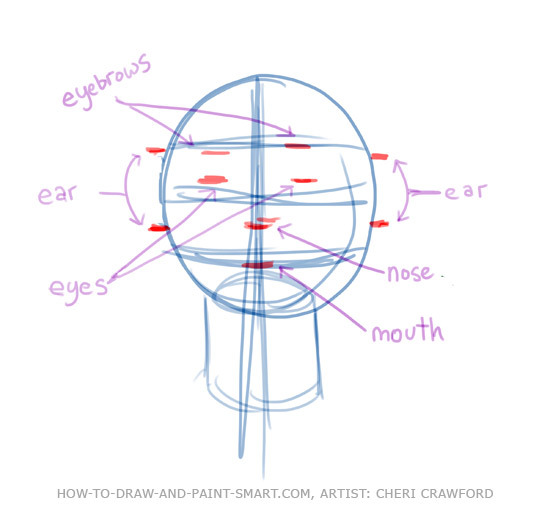 Using the marks you just made, draw the eye shapes, eyebrows, nose, and mouth. Continue to solidify your character head's face. 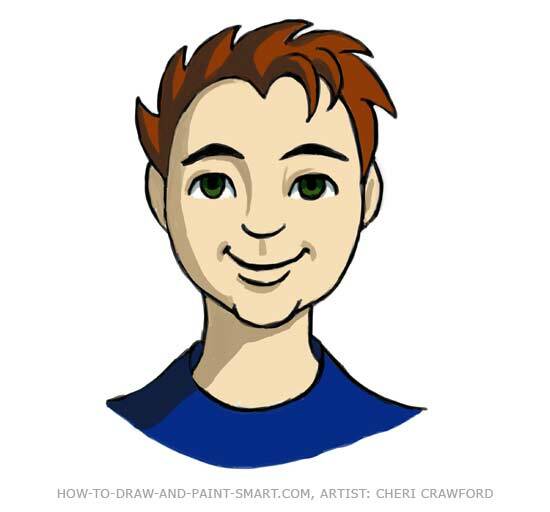 Draw in the ears, outline the face's shape how you want it, fill in the eye shapes with the irises, and put little creases at the smiling mouth corners. Another fun part-the Hair! 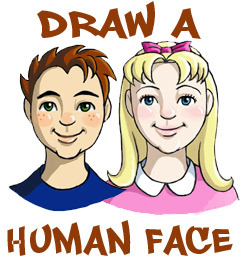 Because this human head shape is very simple, you can use it to make a boy or a girl. 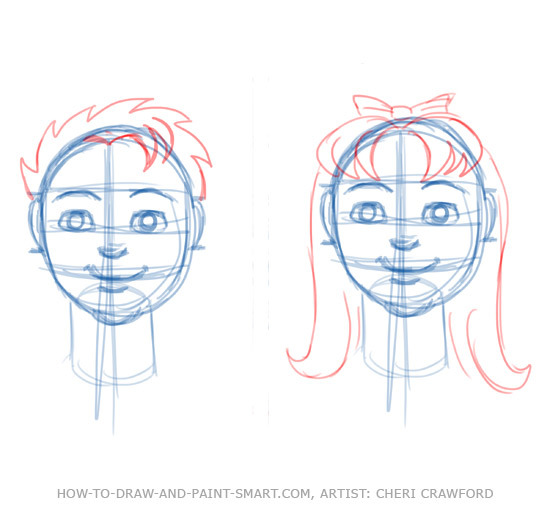 Be sure to lay out the hair in simple shapes first, then you can add tufts and ends. Smooth out the neck and add a shirt collar. Notice how the curved line of the collar seems to be wrapping around the neck? Feel free to lightly connect the two lines for accuracy (they can be erased after the final inking). Time to finish up with details and finishing outlines. I darkened the eyebrows to make this boy look a little more masculine, and added pupils to the eyes. Make the final outline in ink. 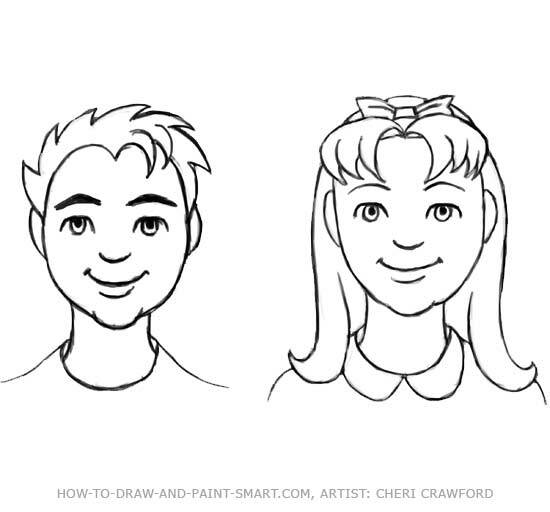 Erase your pencil work, your character(s) is ready for color and shading. Put in your basic colors. 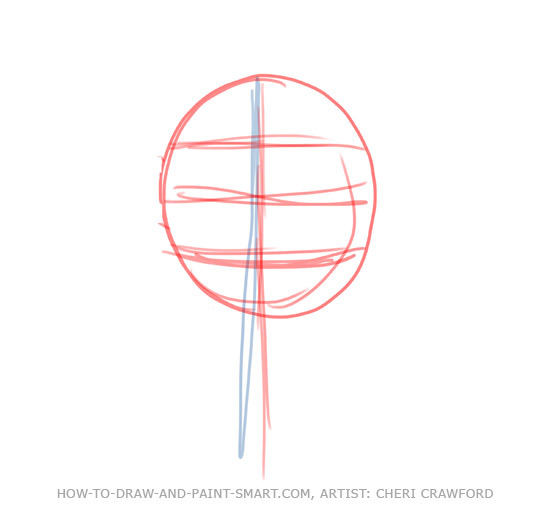 In order to shade, you need to decide where your light source is going to be within the image. I have placed the light source for this particular image on the right side of the character, so the shadows will be mostly on the left side of the face. Next add some slight blush to the cheeks, nose, and lips. Look in the mirror and to see if you can find the warm hues on your own face. Add a little highlight to the hair and eyes on the side of the character that has the light source. Time for the finishing touches! The final highlights will be on the eyes, nose, lips, and cheeks. 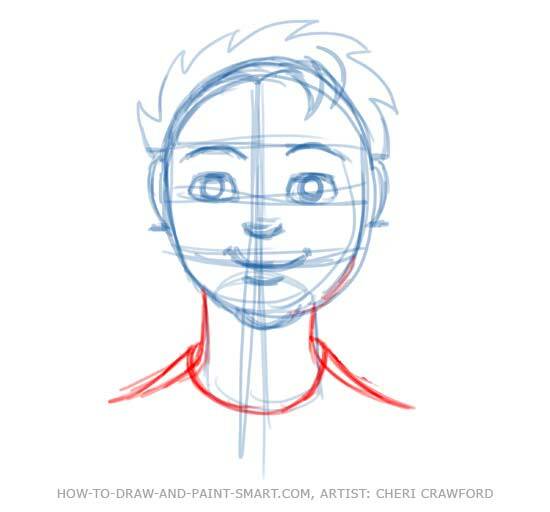 Find More lessons like Draw a Human Face on the How to Draw People page.